Shown here is a sample of textured paper. The 3D image on the left shows the surface as measured; on the right, the overall form, or waviness, of the sample has been removed, revealing the underlying surface texture. COLUMBUS, IN (August 29, 2018) – Digital Metrology Solutions, Inc., developers of measurement software, technologies, consulting and training, have announced the release of OmniSurf3D for 3D surface texture visualization and analysis. 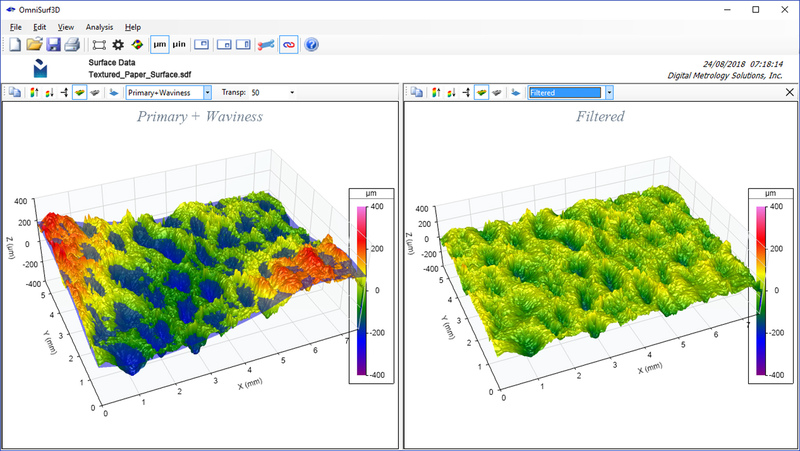 The new software provides a suite of three-dimensional surface analysis tools that can be quickly mastered by non-metrology experts as well as advanced users. The OmniSurf3D software package’s primary strength is its streamlined interface which conveniently puts all basic settings in one place: Preprocessing to account for missing pixels, outliers, etc. ; several common reference Geometries for removing overall shape to reveal the surface texture; Filtering to highlight large-scale waviness or fine-scale roughness; and dozens of ISO and custom Parameters to describe the most critical aspects of the surface. Underlying the easy-to-use interface, however, is a robust set of quantitative as well as qualitative measurement tools. Advanced users can zoom on a particular Region of Interest, rotate, apply and position cross-sectioning tools in real-time, and alter filter parameters interactively. The software can import datasets from virtually all common metrology systems and software, including the standardized “SDF” and “X3P” formats. Advanced functions include ISO 25178 feature detection (Wolf Pruning) to define hills, dales, pits, peaks, saddles, ridge lines and course lines. More information on OmniSurf3D is available at https://digitalmetrology.com/solution/omnisurf3d/. Digital Metrology is committed to the development and deployment of measurement technologies. With 25 years experience in metrology software development and an extensive network of university and industry resources, Digital Metrology provides customized metrology systems integration, software, consultation and training, helping clients develop, interpret and apply measurement results to their specific situations.